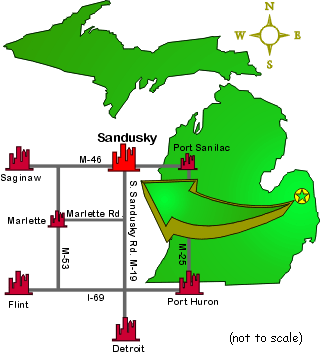 The City of Sandusky is located near the geographical center of Sanilac County, Michigan. City Hall is located at 26 W. Speaker Street. City Services are located throughout the city. For specific information on city departments and their location, check the City Services Page. Sandusky Schools are on our City Map. Looking for another school? Try HS Maps On-Line. the Cedar Point Website or Sandusky, Ohio. Adobe Acrobat — Many downloadable documents on our Website are available in Adobe’s portable document format (and carry a file extension of .PDF). This is the reader you need to view and print PDF files — and it’s free. Click the "Get Acrobat Reader" button to download the latest free version of the Acrobat Reader. Macromedia Flash – Certain parts of this site require the Macromedia Flash player for proper viewing. Click the "Get the Flash Player" button to download the latest free version of the flash player. Java Software is required for your web browser to be capable of viewing several features on our Website. Java lets you enjoy the text scroller, photo slide show and much more. Click on the button to the left or the link to download the latest Java software.